Spring awakening – what’s happening in the woods? Spring is in the air, the snowdrops are making way for the daffodils and the forests and woods of the Blackdown Hills AONB are waking from their winter tranquillity. Bluebells and pimpernel are already poking their heads from the soil now and, despite mixed weather, we’re welcoming lots of visitors to our sites. It’s a very special time of year for wildlife and our forests. As nature wakes up, the days are gradually staying lighter for longer, presenting more opportunity for us all to spend much needed time immersing ourselves in the great outdoors and enjoying the associated wellbeing benefits. 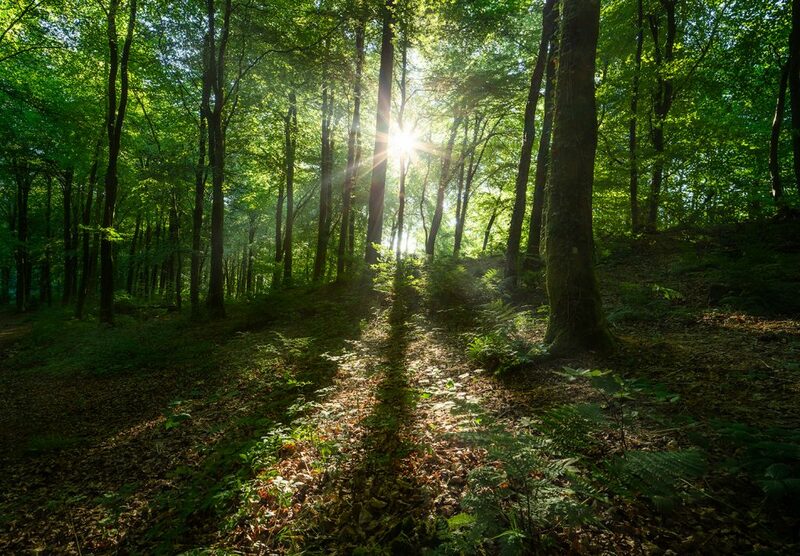 It’s a time for new ventures, new life and the perfect opportunity to come and visit some of the spectacular woodland on offer in the Blackdown Hills. As the weather improves (storms aside! ), I love to watch our forests grow in popularity. It isn’t surprising, thanks to spectacular views on offer from Castle Neroche and Staple Hill, and the cool temperatures under the woodland canopy offering much needed shelter on hot summer days. Our woodlands attract families seeking adventures, outdoor and active enthusiasts, as well as wildlife and survey experts. And with the influx of human visitors, we also look forward to seeing a growing number of furry friends enjoy the sights, sounds and smells of the forest. One of my challenges, at this time of year, is helping our visitors – both two- and four-legged – to stick to the Countryside Code by leaving only footsteps when they depart. I know we all agree that our beautiful forests look more attractive without plastic bags piled next to signage, gateways and hanging from trees. And the health risks to people and wildlife of un-bagged dog waste are well known. So, what are we doing to help our poo-ches and their humans? With the support of local residents and visitors, we will be installing a number of dog poo bins and setting up regular collections at some of our most heavily visited sites. Whenever possible, we still encourage you to take your pup’s waste home to put in your general rubbish. When this isn’t possible, we hope that the introduction of waste bins will help ensure that Forestry Commission sites in the Blackdown Hills remain safe and attractive places for people to visit, explore and enjoy the wonders of our woodland. Clean forests support amazing wildlife and the Forestry Commission will be working with Blackdown Hills AONB, British Trust for Ornithology and local amphibian and reptile groups in the coming months to survey for adder and nightjar. We’ll be seeking volunteers to help with these projects, so keep an eye on our local Forestry Commission Facebook page and the Blackdown Hills AONB website’s volunteering page for opportunities to get involved and support your local wildlife. We will hopefully see you there!